Photo from Philippine Daily Inquirer showing former Health Secretary Janette Garin administering Dengvaxia vaccine shot on a school girl. Christmas is the most beautiful season of the year and its observance in the Philippines is acknowledged the longest in the world. But political developments recently exposed by ongoing Senate Blue Ribbon Committee hearings tend to steal Christmas from the hearts of many Filipinos who are depressed about those hearings. The Grinch that’s stealing our Christmas refers to the ramifications of the scandalous P3.5 billion that the past Aquino administration paid to a major world pharmaceutical companies, the Sanofi Pasteur---for the purchase of the Dengvaxia vaccine against the dengue mosquito that’s endemic to our country. The Dengvacia vaccine is endangering the lives of tens of thousands of Filipino schoolchildren who have been inoculated with it. Of the 731,000 schoolchildren vaccinated, at last count nearly a thousand young students fell sick over five months after receiving the first of three doses. 30 of these cases were considered serious enough for hospitalization, and at least four deaths have already been recorded. But just as serious, the Dengvaxia deal has also made us the laughing stock of the international pharmaceutical world, as we try to collect P3.5 billion in tax-payers’ money from Sanofi Pasteur---a lawsuit that we know would take an awful lot of money to win in an international court. We also know very well that international sympathy will not be with us on this case. Why? Because we entered into the contract with Sanofi in a rush, without the due diligence needed to study such a delicate health issue, and obviously with another aim in mind---the political angle. The almost inevitable conclusion is that the Liberal Party, then in power, was rushing to raise kickback funds to help finance its campaign for the May 2016 elections. The entire science community in this country, except those affiliated with the Department of Health, is appalled at the lack of due diligence, the rush to contract with the vaccine maker and the subversion of procedures defined by law. The worried Filipino public, in trying to fully understanding what happened in this monumental fiasco, is likely to suspect--- as do a good number of senators in the Senate Blue Ribbon committee--- that efforts were directed toward raising funds for the national elections of May 2016. In other words, Dr. Dans was saying that the decision-makers in the DOH---those who decide to buy the vaccine--- should respect the scientists who are trained for many years and often in renowned institutions abroad, to assess its safeness and efficacy. These are, mainly, the Food & Drug Administration (FDA), which was created from the former Bureau of Food & Drugs in 2008, and the Philippine National Drug Formulary (PNDF) which decides the scientific basis for procurement of drug products, under Administrative Order No. 8 issued in 2006. What happened in the case of Dengvaxia and Sanofi, Dr. Dans told the committee, “was BAD SCIENCE” (underscoring mine)---the policy makers overruled the scientists. Dans cited as “victims” of this “bad science” the WHO, the DOH, the physicians who ended up prescribing the medicines and the patients on the receiving end. The chronology of events as compiled by CNN Philippines encourages the conclusion of wrong use of power by the Health Department headed by Secretary Janette Garin and inevitable collusion among certain agencies of DOH---the corrupt for the fund of it and the uncorrupt because they were overruled and scared for their tenure. In November 2014 President Aquino met with the Sanofi Senior VP in the Asia Region, Jean Luc Lowinski, at the Philippine Embassy in Beijing. 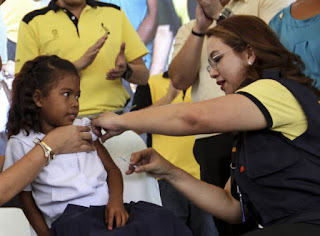 In June 2015 Secretary Garin negotiates with Sanofi to reduce the cost of the vaccine. In October 2015, Sanofi applies at the DOH for inclusion of its vaccine in the Philippine National Formulary. So far so good. By December 1, 2015, in the sidelines of the UN Conference on Climate Change in Paris, Aquino and Garin met Sanofi officials in the French capital where they were treated royally. Nine days later Garin submits a proposal to the Budget Dept. to buy three million doses of Dengvaxia, and gives it marketing approval in our country 12 days later. This made PH the first to license its use for the prevention of dengue in Asia. The succeeding events came with rapidity and show where the corruption possibly came in. The FDA approves the drug for preventing diseases caused by all four dengue types, and on Dec. 28, 2015, the DOH-Family Health office submits a request to Garin to exempt Dengvaxia from being included in the Philippine National Formulary, which, in turn, exempted it from review by the Formulary Executive Council (FEC), THE HIGHEST OFFICE THAT DETERMINES WHICH DRUGS GO INTO THE NATIONAL LIST OF ALLOWED DRUGS IN PH. A day later, the Budget Dept. issues a P3.5 billion Special Allotment Release Order (the controversial SARO of old again rears its ugly head here) to Garin’s office for the vaccines. The Philippine Children’s Medical Center makes a P3-billion purchase order for the vaccines WITHOUT FEC APPROVAL. Garin issues a Certificate of Exemption for the vaccines to be pilot-tested in NCR, Region III and IV-A with a big hoopla. The rain on Garin's coming-out party came in March 2016 when WHO released a paper asserting that Dengvaxia “may be ineffective or may even increase that risk in those who are seronegative at the time of first vaccination.” WHO called for more studies, but Garin already issued a P3 billion disbursement voucher to PCMC to fund the purchase from Zuellig Pharma, its distributor. The vaccines were paid for by the government. As CNN pointed out, WHO stressed that the vaccine “may be ineffective or may theoretically even increase future risk of hospitalization or severe dengue illness in those who are seronegative at the time of the first vaccination, regardless of age.” Another warning from the Imperial College of London's study which asserted that Dengvaxia could lead to an increase in number of cases of the disease, if not implemented correctly. The Singapore Health Sciences Authority also piped in with “postulated risk” of the Sanofi vaccine. Factors were now conspiring to stop Dengvaxia in its tracks. The hearings on Dengvaxia will continue. Former President Aquino, in answer to summons, testified that no one advised him against procuring Dengvaxia (in other words, walang alam). A P3.5 billion outlay for imported vaccine and he is unaware of it? Secretary Duque pinned the blame entirely on his predecessor, Janette Garin. I totally agree with Sen. J. V. Ejercito: those responsible for the bloody mess should be charged asap---with P-Noy and Garin possibly with technical malversation. The Grinches. It is always good to see people reviewing new and different tech products. I would love to get my hands on that honeycomb speakers too.